Sen. Bernie Sanders on Wednesday saved a young woman from getting hit by a car in Washington, DC. Amy Currotto, 26, said she was in “complete awe” to see Sanders shouting at her to get out of the street. Currotto said the senator was “very, very kind” and even obliged her request for a selfie. Amy Currotto was deep in thought as she headed to a guitar lesson on Capitol Hill on Wednesday and wasn’t paying attention as she started to cross a busy intersection. She was walking straight into oncoming traffic when Sen. Bernie Sanders stepped in and saved the day. As she turned around, Currotto was so shocked to see that the panicked screams were emanating from the former presidential candidate that she froze like a deer in headlights. After a few more seconds of being in “complete awe,” Currotto got back to safety thanks to Sanders. “So that’s a bit of an embarrassing story for me, because I was being a complete idiot in the middle of oncoming traffic,” Currotto said, laughing. After they took the photo, Sanders apparently “bolted” toward the Senate as people started to notice that he was in the area and a crowd began to gather. Currotto, a law student at the University of the District of Columbia from Tampa, Florida, said she was a big fan of Sanders. She said she worked as an intern on the Hill in the House of Representatives a few summers ago and was disappointed that she never ran into Sanders then. On Wednesday, Currotto finally got her chance to meet him. Currotto said that if she hadn’t been so surprised to see him and had more time, she would have asked him whether he would run for president again in 2020, a topic of ongoing speculation. 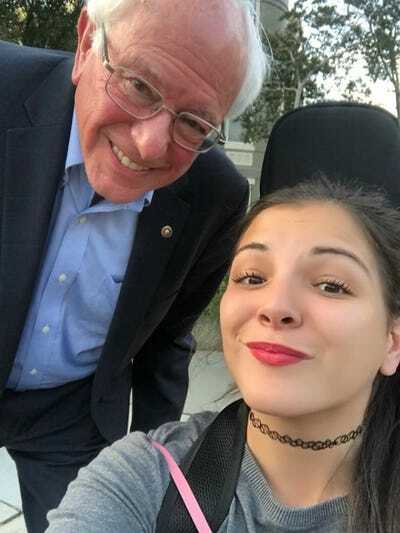 Sanders apparently didn’t tell his staffers about what happened as he returned to his office on Wednesday, but they eventually found out via social media after Currotto posted the selfie and it went viral. The senator’s office did not immediately respond to a request for comment on the incident.